Corsearch provides products and services to support the entire lifecycle of a brand. Our 2018 acquisition of Yellow Brand Protection enables the companies to join forces and provide the industry with a forward-looking offering of brand protection services to support the creation, establishment, growth and protection of valued IP. To Learn More About Online Brand Protection, Visit YellowBP.com! 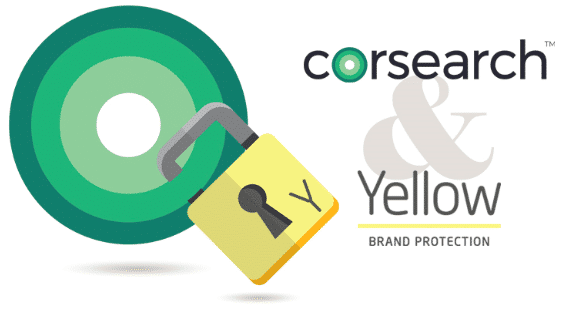 Yellow Brand Protection, founded in 2010, provides online brand protection for brands with resources to combat reputation risk, trademark abuse, counterfeit product sales and revenue loss anywhere online. Yellow now provides services to four of the top ten “World’s Most Valuable Brands” according to Forbes. An intelligent search algorithm clusters all available online and offline data to guarantee that the biggest threats to your brand are identified and prioritized. Deep enforcement experience, strong relationships with online platforms and automated evidence results drive efficient enforcement both online and offline. Yellow Brand Protection offers an unrivaled combination of experience, technical expertise, legal insight and global reach to ensure that a brand is safeguarded with online brand protection from fraudsters locally, globally, today and in the future. Discover how these online brand protection services provide the broadest online search capability in the industry. Find out how Yellow Brand Protection can protect your brand online from counterfeits, copyright infringement, web traffic diversion, parallel imports and other online IP abuses. For 70 years Corsearch has empowered legal and brand professionals with innovative solutions and insights to help them establish, manage and protect brands. Narrowing your list takes valuable time and resources. And when one or more brand name candidates are under consideration and you need the most reliable options. Corsearch Screening helps you and your clients knock out brands unfit for full legal clearance. Corsearch offers a wide range of clearance searches, and helps you fully evaluate and understand all the obstacles and risks facing your proposed mark. The Corsearch Search Solution provides more features and tools than any other standard trademark search in the industry. Once you have cleared and registered your mark, maintaining its uniqueness is key to ensuring its continued value. At Corsearch, expert Watching specialists closely monitor new filings and publications of marks that may be confusingly similar to yours and notifies you of any findings. Are you prepared to craft a domain name strategy that addresses the entire brand lifecycle? The process of securing and protecting domain names is vital to brand value, especially as the domain world becomes increasingly complex. Corsearch offers a broad portfolio of domain name services to support the creation, management and security of these important assets. Please fill out your contact information and a member of our Customer Support team will email you a download link.